Some questions come up regularly. To make it easier for your we have listed replies to the most common questions below. If you have any further questions, do not hesitate to contact us. What can you expect at Elephant Special Tours? What tours do we offer? Why are our tours worth their price? Is prophylaxis for malaria necessary? There is no known risk of malaria infection in the area where our lodge is located and the tours are conducted, so no malaria prophylaxis is required. Nevertheless we recommend consulting your GP or traveller’s clinic for further information before your trip. Generally, important vaccinations like tetanus and typhoid fever should be up to date. However, especially for longer stays more vaccinations may be required. We recommend consulting your GP or traveller’s clinic. What kind of clothes are suggested? We recommend clothing that can get wet and dirty. In our experience, bringing several shirts, comfortable and resilient trousers, and trekking sandals suffices. In addition to shirts with the Elephant-Special-Tours-Logo, we offer so-called Mahout-trousers for sale, which are especially designed for the purpose of elephant riding. We do not recommend heavy shoes such as hiking boots as they do not dry out easily, or not at all during the rainy season. Should I bring money along and in which currency? The Thai currency is Baht – the exchange rate changes daily and varies between approximately 34 Baht and 36 Baht for 1 Euro, between 28 Baht and 32 Baht for 1 US Dollar and between 45 Baht and 52 Baht for 1 GB pound. We provide full board on our Elephant Special Tours trips, nevertheless, you should consider bringing enough cash money for tips, presents for the loved ones at home, and the consumption of beverages other than drinking water. It is not possible to exchange or withdraw money from your account in our little valley as no ATM is present. This should be done beforehand in any bigger city. What are the visa regulations? Currently, state residents of the EU as well as Swiss citizens do not need to apply for any visa if their stay in Thailand does not exceed 28 days. If you are planning to stay up to 3 months in Thailand, a tourist visa, which you can obtain in any Thai consulate, is required. Important: Your passport needs to be valid for another 6 months after leaving Thailand. How are the weather conditions in the area? Our camp is situated near a place called Mae Sapok, which is located in the mountains at an altitude of about 500 meters above sea level. The semi-tropical climate of Northern Thailand is defined by three different seasons. From May until early November the rainy period provides temperatures up to 32° C (90° F) in the shade. Heavy rainfalls are common, but contrary to the south of Thailand they rarely have a monsoon-like character. The cold season starts in November and lasts until the middle of February. During the day, the temperature reaches 25° C (77° F), however by night it can get quite chilly, approximately 7° C (45° F) – warm clothes are strongly suggested. The hot season starts afterwards and lasts until the end of April, with its climax in mid April, just in time for the Thai New-Year ‘Songhkran’ festival. During these months, the almost always beaming sunshine causes temperatures to soar up to 42° C (107° F). Accident insurance is included free of charge in your trip at Elephant Special Tours. As for us being a Thai corporation, we do not offer travel cancellation insurances. Thai cancellation insurances unfortunately do not cover European travellers. However, separate cancellation insurances can often be booked through European travel agents. Are the tours suitable for single travelers? Our longer trips (Elephant Handling Course, Elephant-Bonding-Trip) will be carried out regardless of the size of the group. The maximum group size is 6 individuals. There is an additional charge for single travellers of 20%. Even on our short trips (Education Trip, Lovely-Elephant-Trip) it is possible to participate as a single traveller. Please contact us for further information. From which age can children participate in the program? Technically, children are able to join our programs at the age of three years. Every child will have its own elephant, just like the adult participants. Additionally, the elephant’s caretaker (Mahout) will be sitting right behind the child, so he can lead the animal in case of need and to provide further security. Children up to thirteen years obtain a deduction of 30% on the given prices. Other than the offered tours, is it possible to have individual trips organised? 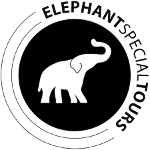 For individual tours please contact Elephant Special Tours personally. We certainly will try to cater to your desires. Is a certain level of physical fitness required for the program? There is no requirement for any specific physical condition to join in. Customers of all ages and any physical condition have so far been satisfied with the performed tours. That said, you know your own body best and should be aware that the tours encompass several days of riding on the biggest land mammal through rugged, mountainous terrain. When in doubt, feel free to ask any questions. What about protection against mosquitos? Mosquitos are, as in the rest of the country, omnipresent in Northern Thailand. Our quarters are protected by enclosures. For the excursions, as well as the tours, we advise insect repellent. Autan has proved itself suitable, but highly effective repellent is also available locally. May I take pictures during the tours? Providing you with visual memories of your extraordinary holiday is included in the services of Elephant Special Tours. To allow you to better concentrate on the elephants while staying in our camp, our very skilled staff will take care of your camera and keep precious moments lasting. You can find a first impression of our previous work in our gallery. Which other precautions should I consider? With a lot of anticipation for the experience and a high dose of enthousiasm to get up close with these wonderful animals, an unforgettable experience will await you at Elephant Special Tours. Is there any religious particularity to respect? We will also visit Buddhist temples on our excursions, in which certain habits have to be attended. Explanations will be given before the start of the excursions.